One of the most satisfying experiences a fisherman can have is to catch a fish on a home made lure he has fashioned with his own hands. The trout angler has excellent books on how to tie your own flies, but little information has been available to anglers who want to make your own fishing lures such as plugs, spoons, spinners, jigs, sinkers and other freshwater and saltwater lures. It is not necessary to be a skilled craftsman to make fishing lures. Most anglers already possess the ability to handle the few necessary tools, and if you follow the directions in this web site on fishing lure making, you can make excellent lures. The lures may not look professionally perfect, but they WILL catch fish, and that's all that really counts. Add our RSS to your "My Yahoo!" Add our RSS to your "My MSN"
And if you learn how to make your own fishing lures, you'll probably catch more fish, in the long run. The reason for this is psychological. An angler who uses a store-bought plug or jig tends to be hesitant about casting it around rocks, logs, piles, and masses of seaweed. He figures he has paid good money for it and doesn't want to lose it - even though he knows some of the best fish are caught around such obstructions. And other lures such as jigs are most effective when bounced on the bottom, when they often get fouled and lost. So, rather than lose his costly lures our cautious angler casts into safer spots, which contain fewer fish! If you know how to make your own fishing lures, you just won't have such inhibitions. You figure that the lure you tie to your line cost very little in cold cash and is fun to make. So what, if it is lost? The angler casts into all kinds of risky spots and loses some lures. He also catches more than his share of fish. Another good argument is that the angler who buys his lures in a store usually carries only one or two of a certain type or size. 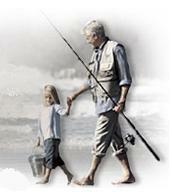 If he loses them, he's through fishing for the day, if the fish happen to want that particular lure. But the knowledgeable make-them-yourself angler usually has plenty of spares and rarely runs short. His spares are only limited by how much fishing lure making supplies he has. Making fishing lures can be an enjoyable hobby, especially during the long winter months when fishing is slow. It has even been argued that the joy of designing and creating a lure offers as much if not more pleasure than the actual fishing. And if you are a parent or grandparent, you can spend some quality time with your child or grandchild crafting lures of all sizes and shapes together. Feel free to explore this web site and use your imagination and creativity to expand upon the lure designs here. P.S. In case you can't find the information you need or you prefer to search the web site, go ahead and use our Google-powered search engine. © 2008 Make-Your-Own-Fishing-Lures.com. All Rights Reserved.